with more than 160,000 visitors (2019) and more than 2,327 exhibitors (2019) is the leading trade fair world-wide for the dental industry. It is trend-setting, provides essential stimulus for the dental world market and initiates the development of innovations in dental practice and dental technology. 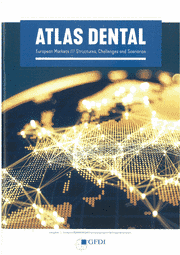 For many, decades the IDS has been the unchallenged as the most successful, and most comprehensive, presentation arena and global venue for all market participants from dentistry, dental technology, dental trade and the dental industry. 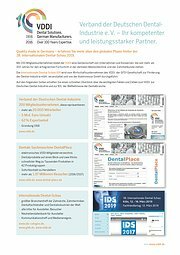 Throughout 80 years, the Association of German Dental Manufacturers (VDD) through its Gesellschaft zur Förderung der Dental-Industrie mbH (GFDI mbH), in partnership with the Koelnmesse, has organized the IDS, guiding its development as an indispensable marketing tool for the international dental sector. The IDS is a “must” for exhibitors: those seeking to score direct sales hits and to establish direct, effective and gaugeable customer contact, who want to use successful and image-oriented presentations for new business achievements, who want to accurately estimate market probability within the shortest time, are those who participate at the IDS. How do you evaluate the information & contacts at the exhibitor stands? The IDS is a vital communication platform for direct, personal customer contact. It is exceptionally suitable for the set-up and maintenance of long-term business associations. The IDS engenders lasting contact management, through first-hand demonstrations by trained co-workers and developers, and by demonstrations of internationally-renowned clients from dentistry and dental technology, high technical level and having a lasting experiential effect.